Rekha a mommy in her late 30’s is a doting woman who loves her family and a cheerful neighbor who loves to talk. She is a homemaker and her day is even busier than Mark Zuckerberg is what she jokingly claims. She loves cooking and attending to her family’s needs. All was going well until one day she was wrapping up her night’s kitchen work and felt a nagging pain in her chest. She was rushed to the hospital where she was said to have suffered from cardiac arrest and declared dead. In her busy life, she ignored to take care of herself and passed off her symptoms of fatigue and mild chest pain. Isn’t this a familiar story? Not everybody’s story ends in a tragic way, but how many take their health seriously? We always think we are healthy, until, one day when you get thwacked with potentially serious illnesses. Health and wellness is a continuum. On one end is a perfect health and on the other total illness. Most of us are born with perfect health but over the period of time learn to ignore minor discomforts like fatigue, headaches, constipation, bloating, and body pains. Unknowingly we start moving towards the illness side of the continuum. Though life is a one-sided traffic towards death our health is not. Health is dynamic and it is certainly in our hands. Given below are some of the powerful ways to keep you on the health side of the continuum. If you ask people what foods are good or bad for you, you’d probably get a dozen conflicting answers. The diet industry thrives by taking advantage of the general public’s desire and promises attractive results. But we never know if a particular diet works for us or not. Your diet should contain food items that keep you satiated for a longer period of time and do not cause spikes in your blood sugar and insulin levels. Depending on your innate metabolism your plate may contain high fiber fruits, vegetables, whole grains, meat, fish, and poultry. You can also include healthy fats such as olive oil, coconut oil, ghee, butter, nuts and seeds in your diet. Foods fall under the following spectrum of alkaline, acidic, raw and cooked. Find the combination that is most apt for you according to your body constitution. 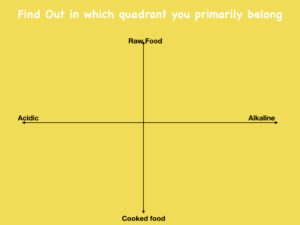 Move around the food quadrants to build resilience but predominantly stay in your quadrant. Foods are classified into acidic and alkaline based on the pH of the residue after digestion. Alkaline foods are fresh fruits and vegetables, and almonds. Most other nuts and seeds are slightly acidic. More acidic foods include dairy, fish, meat, beans, some grains, and sugar. For most of the people, a predominance of alkaline food is better but there may be a few whose body require more acidic foods. Even when you are consuming acidic foods, care should be taken to eat food items that are slow burning and not fast foods. As for cooked and raw food, you need to figure out what works most for you. For some, a diet of raw fruits and vegetables work very well but others may find this diet difficult to digest. For these people, cooked food is best. The key is to figure out how you feel after eating. If you feel fresh after eating and can sustain your energy levels for 3-4 hours then that is a diet for you. Refined sugar and carbs have a detrimental effect on your overall well-being so it’s best to avoid them. You can use natural fruits as your desserts or use natural sweeteners like date and honey. Similarly avoid refined oils, vegetable oils and trans fats found in most bread and confectionary items. Did you know that your lungs also need exercise in order to stay healthy? As you age, your lung capacity tends to go down making you weaker. Your cells will not have the needed oxygen to function optimally resulting in fatigue and diseases. It is not enough if you simply engage in some physical activity, your exercises should be geared towards maximizing your lung capacity. The more your lung capacity increases, the better your stamina and overall health. It is recommended to do exercises that make your breathless for a while and then release. Exercises like Yoga, strength and power training, high-intensity short interval training, and cardio will give an essential workout to your lungs. Pranayama is extremely good to ensure that oxygen reaches every cell and the toxic air is exhaled out during respiration. Not only should you exercise but give your brain an exercise. Learn new skills and language even as you age. There are two sides to your brain – left and right. The left brain is where logical and analytical thinking takes place. The right brain opens up our creative side and is used more for subjective thinking. Typically for a person, one side is more dominant than the other and for most, it is the left side that is dominant. However what is recommended is to find the right balance and coordination between both sides for a healthy mental function. By doing brain exercises, you can achieve this balance and invoke the right brain to work in tandem with the left. This will improve your productivity and wellbeing on the whole. Stress is always viewed in a negative aspect. But not all stress is bad. We need stress in the right dosage so that we get motivated and can get our work done perfectly at the right time. After all, there is no gain if there is no pain, isn’t it? At the same time stress is the root cause of many chronic conditions. The best way to handle stress is to convert stressful situations into eustress or positive stress. Convert your threats into challenges without over-exerting yourself and maintain a positive outlook. This requires strengthening your body and mind with activities such as visualization, meditation, and yoga nidra. Having someone to confide in also helps to de-stress. The other secret to good health is the ability to read your body. Much before a chronic disease takes root in your body it sends many signals. Early recognition of these signs can help you to take timely actions. Follow these five secrets for staying lifelong healthy and fit.